Walter is known to have been the agent for Thomas Taylor, Earl of Bective, between at least 1765 and 1795. He probably would have managed the affairs of Taylor's Headfort estate where it concerned real estate leases. He was succeeded by another in 1795 (maybe due to the death of the first Earl in that year), and it may be that he turned to the buying of Headfort leases, becoming one of the wealthy middlemen mentioned above. It's very likely he had a house built on leased land on Market Street, Kells, which still stands. It is an elegant, two-story building in traditional Neo-classical form and details. 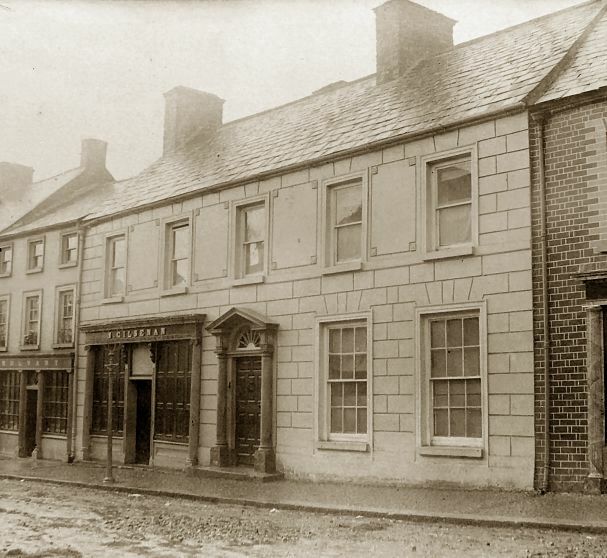 Walter might have been the primary merchant in Kells in the late 18th century. His mercantile concerns, probably tied with his sub-leases, led him to develop a new meat stall on what is now New Market Street across from his backyard. This was known as The Shambles. There used to be a plaque on the Shambles market gate that said "This Shambles was built by Walter Keating of Kells Esq., A. D. 1807. "(2) The building now on that site bears no resemblance to the footprint of the Shambles on old maps, which consisted of three sides with stalls and a gate at the street. Walter is also said to have been instrumental on behalf of the Earl in getting a new market for Kells built next to the Shambles, the buildings of which are still mostly intact. Kells market had previously been in an old castle nearby. Walter Keating, Esq., of Kells... invited me to his house, that he might have the pleasure of forwarding me in my pursuit of portrait-painting. Mr. Keating was agent at that period to the first Earl of Bective, and in his official character highly valued both by his lordship and tenantry; this well-merited reputation gave him an influential power in the country most flattering to his feelings, as it enabled him to serve his friend[s], an office he was always ready to engage in, and never slow to perform. I had the good fortune to be numbered with his favourites, and he having witnessed my emerging from trade to embrace the fine arts, he felt a strong interest in my welfare, and said I should paint a dozen portraits of him and family, and that he had little doubt of recommending me a sufficient number to keep me some time in full practice. He appointed the next week to receive me at his house in Kells, and with a friendly invitation and grasp of my hand took leave. On my arrival at Kells I received a dreadful shock. My friend, Mr. Keating, was confined to bed, attended by two physicians, with an inward inflammation. The disease had baffled their skill, and a statement of his case had been sent to the College of Physicians, Dublin. Recommendations came from Dublin and a retired doctor twenty miles away arrived to try a cure. Nothing was working, and there were preparations for the worst outcome. Herbert knew of a Dr. Wilson in Cavan with a reputation for handling desparate cases, and he convinced Walter's wife Elizabeth to send for him. The doctor arrived at twelve o'clock at night...so grotesque a figure I never saw before or since He apparently suffered from severe osteoporosis and had lameness in one leg. ...he appeared falling, until you observed a strong crutch stick...for his support. He had a large head, a face as brown as oak, a hawk nose and only one eye - that eye was like an eagle's. an artillery of medicine, bleeding, blistering and topical applications, yet in one hour this rough, unpolished man, derided by professors, called kill or cure but lauded by the public, had succeeded...When we came to the parlour the children were all present, and Mrs. Keating. 'Well, madam, how do you do [said the doctor,] - I did not notice you before, I was anxious only for my patient. Now, let me ask you how many children have you?' 'Fourteen' 'And you are still a stout woman. You expect to learn from me...my opinion of my patient. Let me relieve you. I think you may yet bear fourteen children more by your partner, for, if I am not greatly out in my prognostic, I will have him on his legs in fourteen days.' He sent to [Headfort House, home of the Earl of Bective]...for ripe fruit. This and oatmeal porridge made on new milk were his [Walter's] chief sustenance for some days, then gradually...wild fowl, back of rabbit, mutton chop. In a fortnight Mr. Keating dined with his family, and Dr. Wilson was raised to the skies by the praise bestowed upon him. I was anxious to return your thanks, personally for my worthy agent, Mr. Walter Keating, [the death of] whom there is no man in this country could have been more regretted. His life has been preserved by you...I should have suffered an incalculable loss. Many gentlemen in this and the neighbouring counties must have suffered also [from his death], but the poor tenantry were likely to have been the greatest sufferers of all, for he has been all to them. Wilson and Herbert had lunch with the earl, and the conversation turned to reveal that Herbert was a Keating relative, although nothing specific was mentioned. Herbert said that Walter enjoyed perfect health to his death twenty years later, putting this incident about 1791. The reference to fourteen children can't be confirmed based on current information. The Keatings had at least ten children, and it was physically possible for Elizabeth Keating to have had fourteen by, say, the early 1790s, but this number is probably an exaggeration. Herbert did paint portraits of the Keatings, although there is no reference to them by George R. K. Smith in his reminiscences as there were to the paintings he saw of his aunt Mary (Little) Gray Clinton and her second husband Gen. James Clinton at the Auchmuty's house. I commenced [the portraits] with Mrs. Keating. She was a good subject. I could not have desired a better model to make a show picture. My success was such that, in one month, I had the whole circle of gentry in and about Kells, and as many pictures to do as would require three months to finish. The Keatings' portraits alone filled a large and lofty parlour. These, with my progressive works, made a good show. The Earl had promised to come to the Keating's house to see his work, and he did. Herbert organized a benefit for a poor family in Kells by putting on plays in the old castle. "Young Keating" performed in one of them, but which one? Walter provided Herbert with letters of recommendation from prospective clients across Ireland, including Sir Hugh O'Reilly, for whom Walter is said to have been an agent at some time. Elizabeth (Dyas) Keating outlived Walter. Her granddaughter Jane married John Bennett Smith in the year following Walter's death and they moved into the Keating house in Kells. The Smiths may have wanted to take over Walter's business interests while also taking care of Jane's grandmother. George Smith doesn't mention his great grandmother Keating, but she died when he was four. He only speculates that this house was the Keating's before he was born there, so the very early history of the Smiths in Kells is sketchy. John B. Smith's father had a cloth store in Cavan, and probably having learned that trade from him, started his own store in Kells. It's possible Walter Keating was also in this business, but records found so far only refer to him as a merchant. The Smiths did carry on the practice of buying leases from the Earl of Bective (the second Earl, and the son of Thomas Taylor mentioned above) who had been given the title Marquis of Headfort. Where these leases inheritable assets? Did John Smith acquire them somehow from the Keatings? Walter and Elizabeth were members of the Church of Ireland, and are buried in the churchyard in Kells. Walter seems to have been not only proud of his achievements but also conscious of the importance of family history. Aside from having his name placed at The Shambles, he arranged to have a stone placed in the churchyard memorializing not only himself, but his parents, wife and some of his children as well. sources for vital records: Walter's death is found on his gravestone in the Protestant churchyard at Kells, with his age at death. This is also the source for the name of his wife and his parents. Information from the gravestone was transcribed by Robert Keating Smith in 1893 and is now in the collection of Patrick Verdier. 2. James Dowling Herbert, Irish Varieties for the Last Fifty Years (London:1836). 3. George R. K. Smith memoirs and family notes compiled by Robert Keating Smith.